For a winter wonderland treat, mix up homemade marshmallows and top them on hot cocoa. Part science experiment, part kitchen activity, your kids will be fascinated by the transformation from gelatin and sugar into fluffy marshmallows. 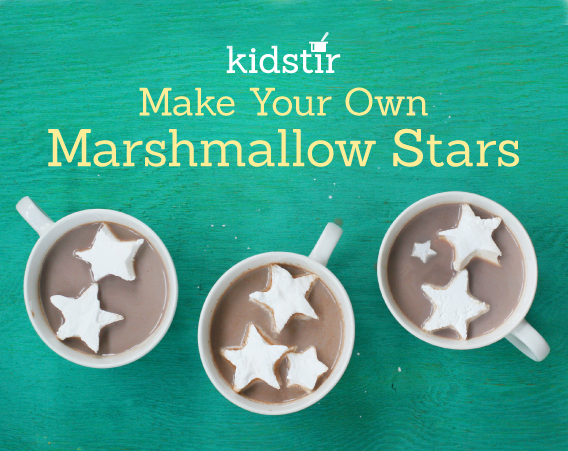 Cut them into star shapes with the largest cookie cutter in the Winter Wonderland kit. 1. Put 1/3 cup of water into the bowl of an electric mixer. Sprinkle the gelatin over the water. 2. Whisk the sugar, 1/4 cup of water, and corn syrup in the saucepan over medium heat. Once the sugar is dissolved, stop whisking and heat the mixture until it boils. Place a candy thermometer into the saucepan and turn off the stove when the mixture reaches 240º. This is a job for grown-ups only because the liquid gets very hot. 3. Carefully pour the hot liquid over the gelatin. Beat on high speed for 10 to 12 minutes or until nice and fluffy. Mix in the vanilla extract. 4. Lightly spray the baking pan with cooking spray. Then use a rubber spatula to transfer the gooey marshmallow mixture into the pan. 5. Allow the marshmallows to set overnight on the countertop. This can take 12 to 15 hours. 6. Lift the marshmallow block out of the pan with a spatula and place on a cutting board dusted with confectioners’ sugar. Then use a star cookie cutter to cut out the marshmallow stars.